Beginning deep underground, in the fiery heart of a volcano, water mixes with molten rock...pressure builds until finally finding a violent, spectacular release. The trapped water in the viscous, super-heated rock flashes to steam, blasting the magma into a frothy stone that cools, hardens, and falls to the earth as pumice. Examine pumice under magnification and what you'll see is best described as a foamed glass stone. That matrix of tiny, thin-walled pockets and grabbing edges are ideal for gently wearing down tooth and claw. Pumice is abundant and found in many parts of the world, but not all pumice is created equal. In the southeast corner of the State of Idaho, northwest of Malad City, lies a vast reserve of white, pure pumice that is in demand all over the world. That demand is the result of two factors: the quality and brightness of the pumice, and the company that mines and refines it: Hess Pumice. The pumice deposit is located on the shoreline of an ancient lake known as Lake Bonneville...a vast, freshwater lake that once covered much of North America’s Great Basin region (most of Utah and parts of Idaho and Nevada). The Great Salt Lake is all that remains of Lake Bonneville. The volcano that produced the pumice is about a mile to the north of the mine. The volcanic ash (pumice) was deposited in the lake, where it was washed and stratified over centuries. This process cleaned the pumice of the undesirable heavy minerals that are often found in other pumice deposits. Scoria is common lava rock, typically red, red/brown, sometimes black that you often see used as a decorative landscaping ground cover. Scoria forms from basaltic magmas, while pumice is of rhyolitic magma origin. The difference is important. Pumice has many more vesicles—trapped bubbles—than scoria and the walls between them are very thin. While the sharp, hard, thick-walled vesicles of scoria stones are harshly unsuitable for nibbling, chewing and gnawing, the thin-walled structure of pumice easily breaks down under tooth and nail, making a pumice stone soft enough for your critter to safely gnaw on, yet hard enough to effectively wear down incisors and claws. The friable nature of a pumice stone means even as it is worn down, it remains consistently effective. And unlike much of the scoria you find, pumice contains no mineral crystals and hence none of the hazards associated with crystalline silica dust. (Pumice powder is used widely as a dust bath for dust-bath loving critters like chinchillas and poultry.) The difference is best understood by taking a Chewlas pumice stone and a piece of scoria (common lava rock) and rubbing them both between your fingers. Which would you rather have your pet chewing on? The stones selected for Chewlas™ are dense, meaning the trapped bubbles in the rhyolitic foam range from tiny to microscopic. And that means Chewlas make ideal chew stones—durable and effective—even for the smallest of critters. 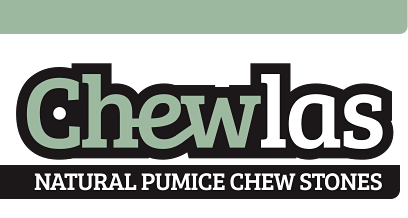 Chewlas™ are a product of Hess Pumice, a natural pumice stone hand selected from our pumice mine, the purest commercial deposit of white pumice on the planet. Chewlas™ are hard and abrasive enough to naturally wear down the ever-growing teeth and nails of your cute little rodentia-order critter, yet soft enough not to cause damage. Chewlas™ are naturally clean and pure. This same pumice is crushed and refined for use in dental polish pastes, exfoliating beauty products, and beverage and water filtration. Chewlas™ are safe to ingest. This same pumice is used in livestock feed as an anti-caking agent. Chewlas™ contribute important trace dietary nutrients like magnesium, potassium, calcium, sodium; also functions as a dietary fiber. Chewlas™ are ideal to meet the instinctual behavior of rats, mice, gerbils, chinchillas, degus, guinea pigs, and hamsters to gnaw and nibble, as their chisel-like teeth never stop growing. Rabbits, while not classified as rodents, (having four incisor teeth rather than two) also love to gnaw and chew. Chewlas™ also make great in-cage play toys to push around, and providing a chew stone can save the wear and tear from gnawing on other parts of the habitat. • Mixed-size Stones (10 - 15 per bag); stones range in size (roughly) from 1 inch to 2.5 inches. In continual operation since 1958, Hess Pumice operates production facilities equipped with the most current refining technology and machinery. 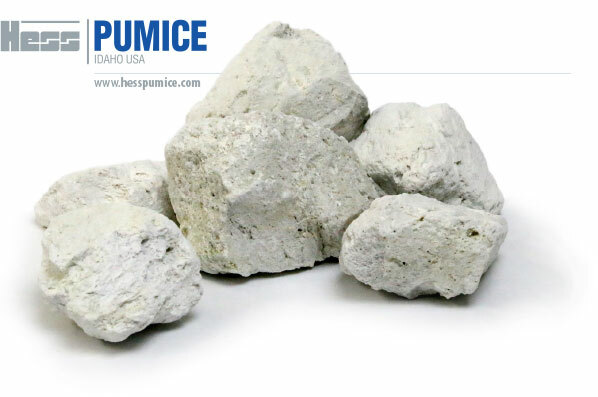 Hess Pumice has a stable source of supply, an exclusive focus on producing precisely controlled pumice grades, and the logistical expertise to ship pumice anywhere on the planet. This focus has made Hess Pumice the world’s leading supplier of highly refined pumice products. Our pumice is fascinatingly versatile, used widely in industry for a variety of processes and products—in personal care exfoliating products, polishing compounds, pencil erasers. It's a functional filler for paints and coatings (non-crystalline silica), a gentle abrasive to polish optical glass, machine parts, even buttons. It is used filtration media for water, oil, and juices. It's a great soil amendment. Our pumice is also a highly-effective concrete pozzolan. And, of course, valuable in several applications for pet and livestock care.